As a reminder by completing the electronic waiver and printing your online credential, you will no longer need to visit the registration trailer to sign the waiver. A drop box will be setup for completed tech cards at the D5 registration trailer. ALL CREW members that do not have a hard card will still need to visit the registration trailer to sign the waiver with the driver’s credential providing authorization for crew to be added to the wavier. When you redeem your online driver’s credential, it will have identification stating you have signed the waiver and have access to the restricted area. The identification will need to be visible when accessing the restricted area for security officials at all times. 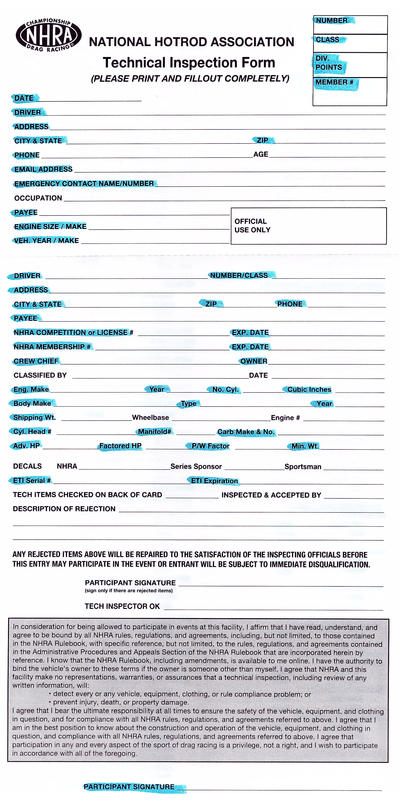 As part of the technical procedure, tech cards must be filled out correctly for the category that pertains to you. Attached is a sample tech card with highlighted areas to help with this process. All Comp and Alcohol competitors will continue to be teched in by a tech representative and continue to follow the existing tech procedures. NHRA Tech Trailer to verify class designation and to receive a weight sticker. Those racers that have not completed the electronic waiver and do not have a hard card will need to sign a waiver at the D5 Racer Registration Trailer.